The Weekend before last I had a few days away from my busy schedule. The Saturday afternoon of the Queens Birthday weekend offered the chance to take in some VFL Football. Thanks to a few issues with public transport I found myself, with company in tow at the Junction Hotel in Newport. I’d only discovered the Junction Hotel a few weeks before after an e-mail from my dad described it as “The best undiscovered pub in Melbourne”. For anyone with a love of good craft beer that statement can mean only one thing – It won’t stay undiscovered by me for too long. Newport, for those of you who haven’t ventured there, is a suburb in Melbourne’s South-West, which can best be described as a bit run-down and rough if you will. Naturally, seeing an old hotel in this area didn’t leave me with high expectations. The refurbishment of the Junction Hotel (which from the outside appears to be your run of the mill 1970’s hotel), creates a spacious feel, with steel stools and thick wooden tables making sure customers have a comfortable experience. Onto the main matter at hand – the beer. Rather than umming and ahhing about what I should have I made the easiest decision – the four 150ml beer tasting paddle for $12. Not only did it stand out in value, but as you can see from the picture below the beers varied in colour, from the Mountain Goat Steam Ale to my more fancied Bridge Road porter and there wasn’t a bad drop amongst them. Another great aspect of the experience was the food, which came served on paddles similar to those the beer tasters were served on, with portion sizes big enough to share and well priced. With the convenience of being right next to a train station there’s no excuse not to go, and with a beer for every occasion, I can guarantee you won’t be let down. 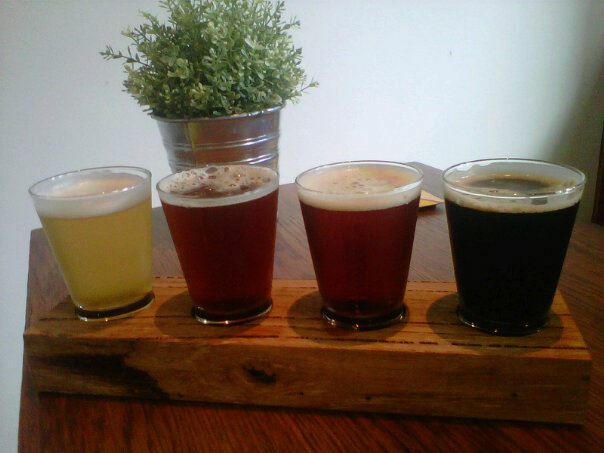 (L-R) Mountain goat steam ale, Grizz American Ale, 2 Birds Sunset Ale, Bridge Road Porter.